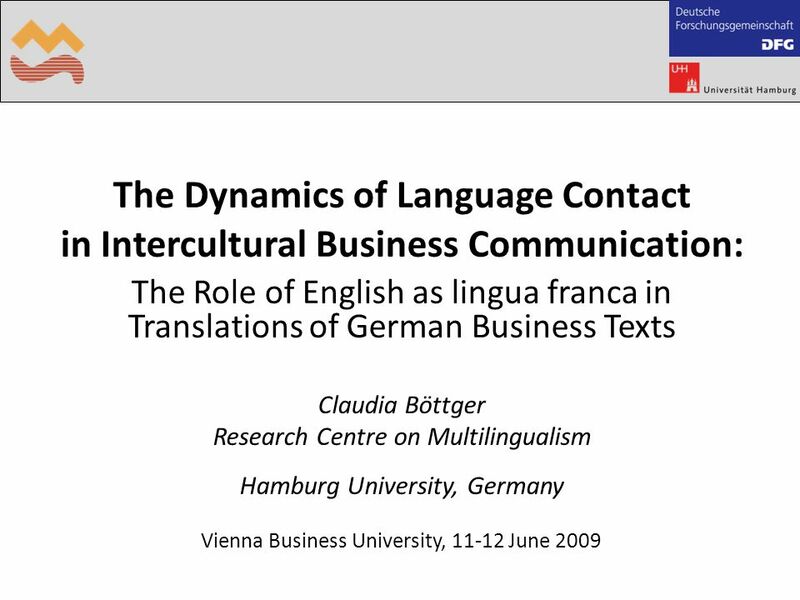 The Dynamics of Language Contact in Intercultural Business Communication: The Role of English as lingua franca in Translations of German Business Texts. 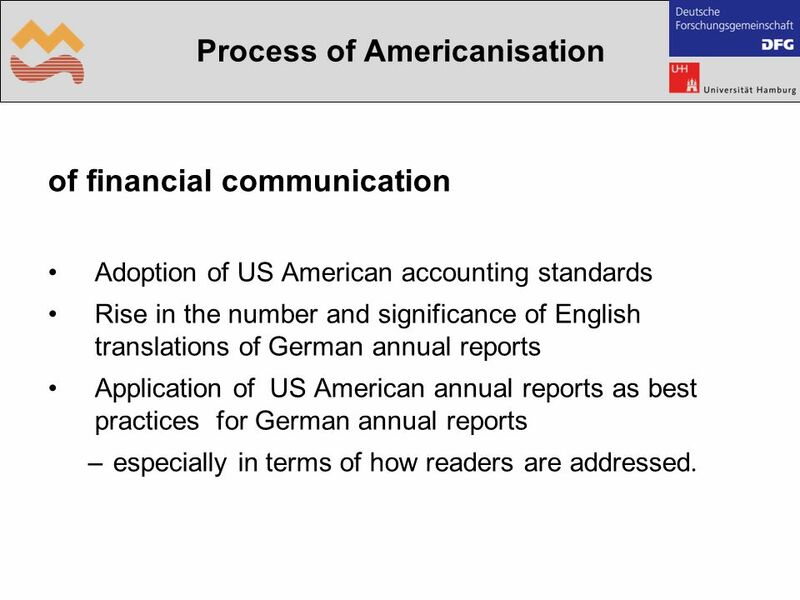 8 Process of Americanisation of financial communication Adoption of US American accounting standards Rise in the number and significance of English translations of German annual reports Application of US American annual reports as best practices for German annual reports –especially in terms of how readers are addressed. 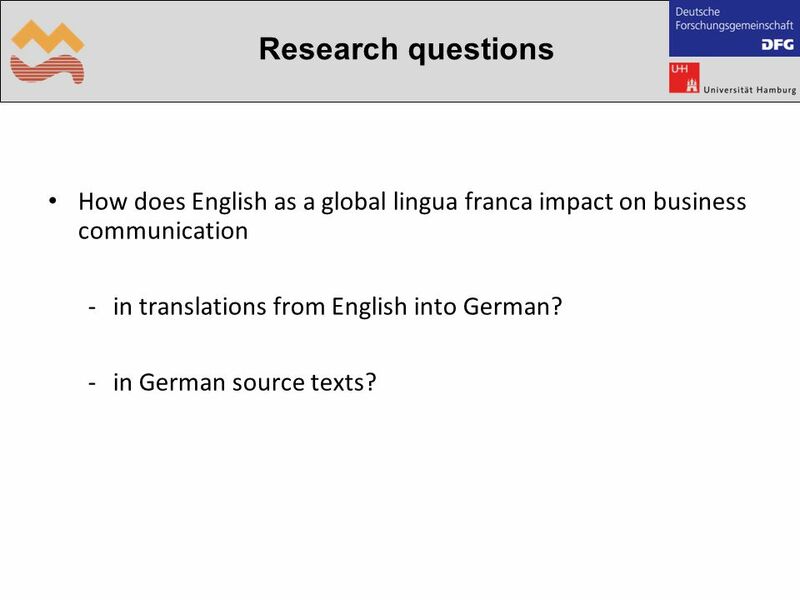 9 Research questions How does English as a global lingua franca impact on business communication -in translations from English into German? 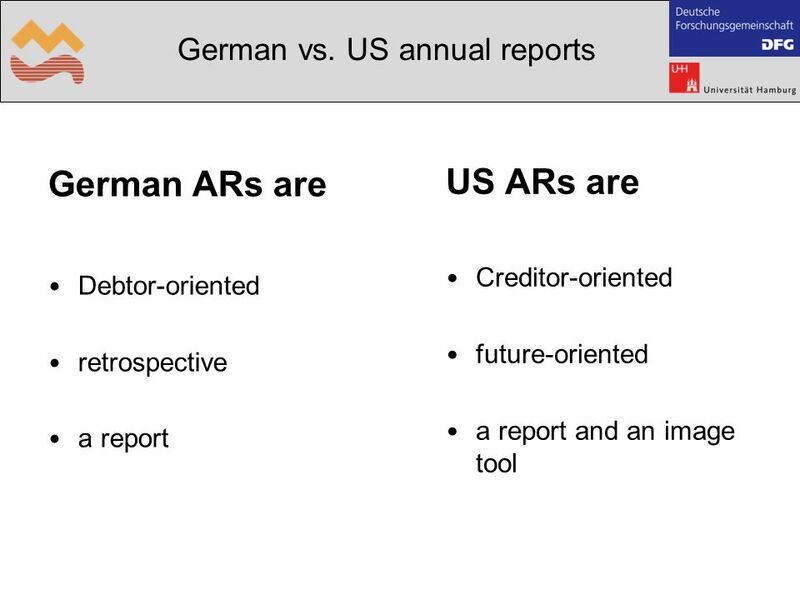 -in German source texts? 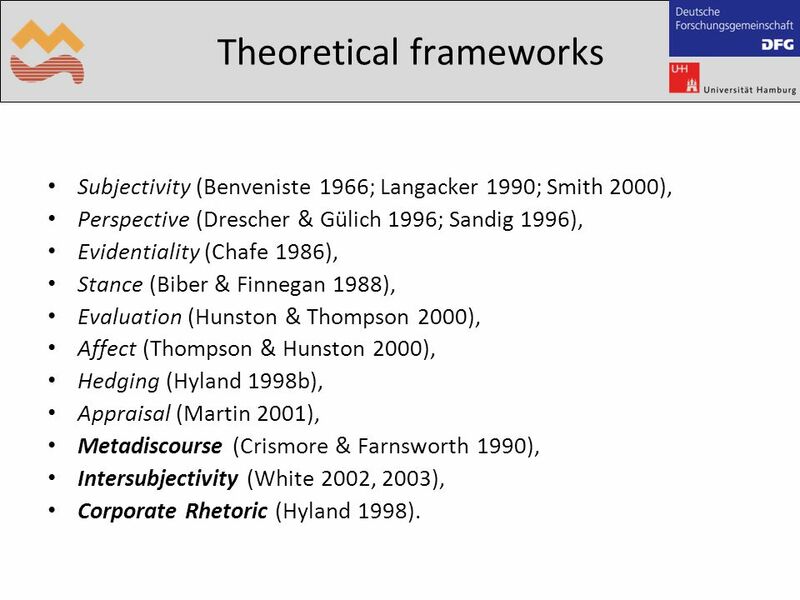 15 Theoretical frameworks Subjectivity (Benveniste 1966; Langacker 1990; Smith 2000), Perspective (Drescher & Gülich 1996; Sandig 1996), Evidentiality (Chafe 1986), Stance (Biber & Finnegan 1988), Evaluation (Hunston & Thompson 2000), Affect (Thompson & Hunston 2000), Hedging (Hyland 1998b), Appraisal (Martin 2001), Metadiscourse (Crismore & Farnsworth 1990), Intersubjectivity (White 2002, 2003), Corporate Rhetoric (Hyland 1998). 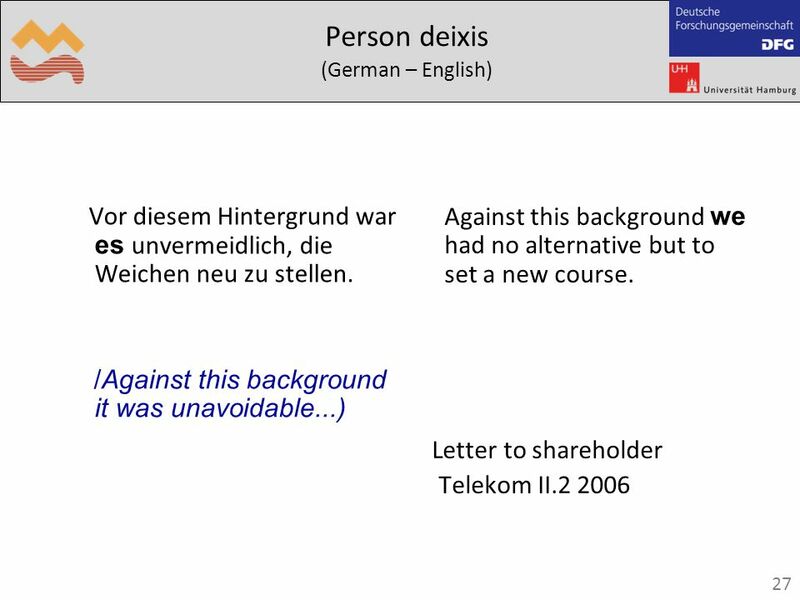 16 Linguistic means and constructions Deixis, Modality (modal verbs, adverbs, particles etc. 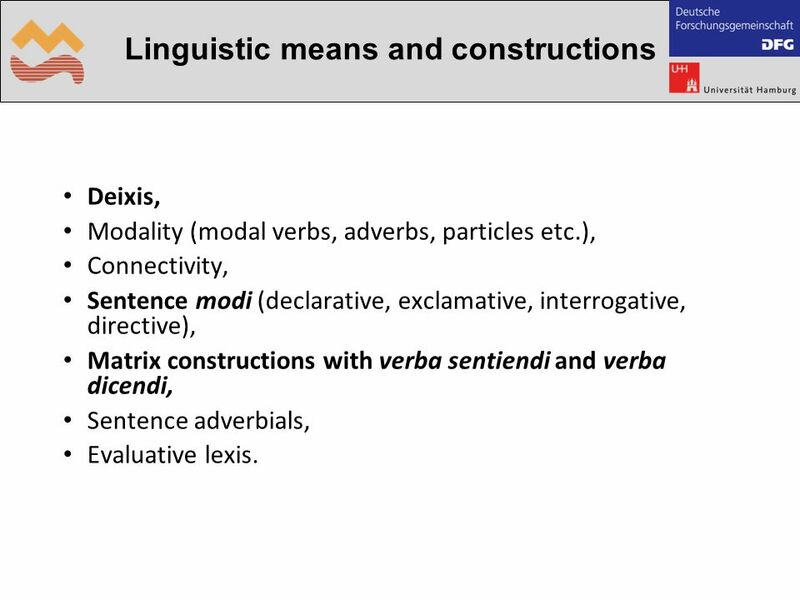 ), Connectivity, Sentence modi (declarative, exclamative, interrogative, directive), Matrix constructions with verba sentiendi and verba dicendi, Sentence adverbials, Evaluative lexis. 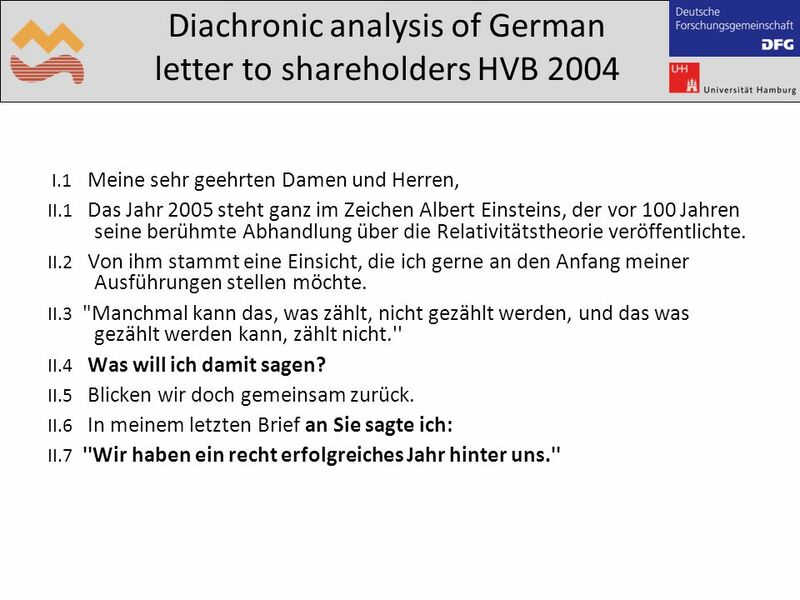 23 Diachronic analysis of German letter to shareholders HVB 1999 Sehr geehrte Damen und Herren, 1999 war für uns ein hartes Jahr; es stand im Zeichen erheblicher Integrations- anstrengungen Wir legten die Plattform für mehr Wachstum und Rentabilität und gehen nun deutlich gestärkt in das neue Jahr. 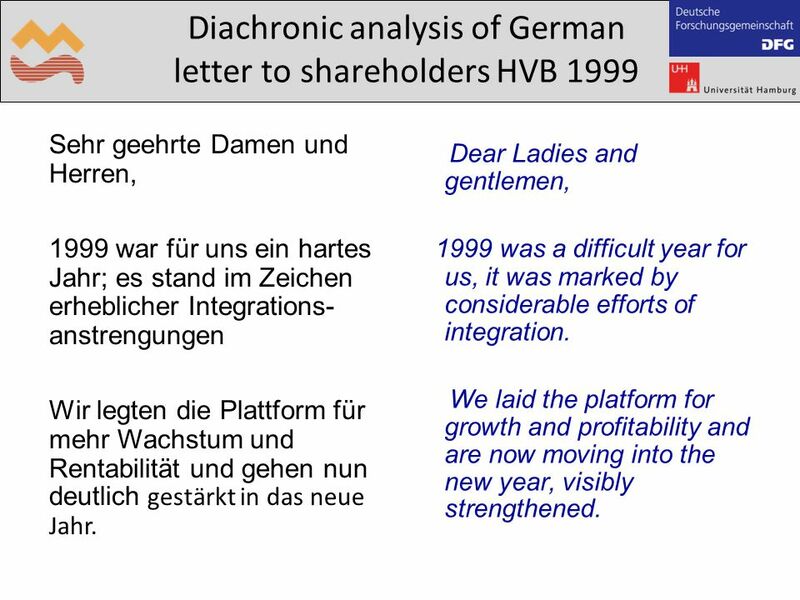 Dear Ladies and gentlemen, 1999 was a difficult year for us, it was marked by considerable efforts of integration. 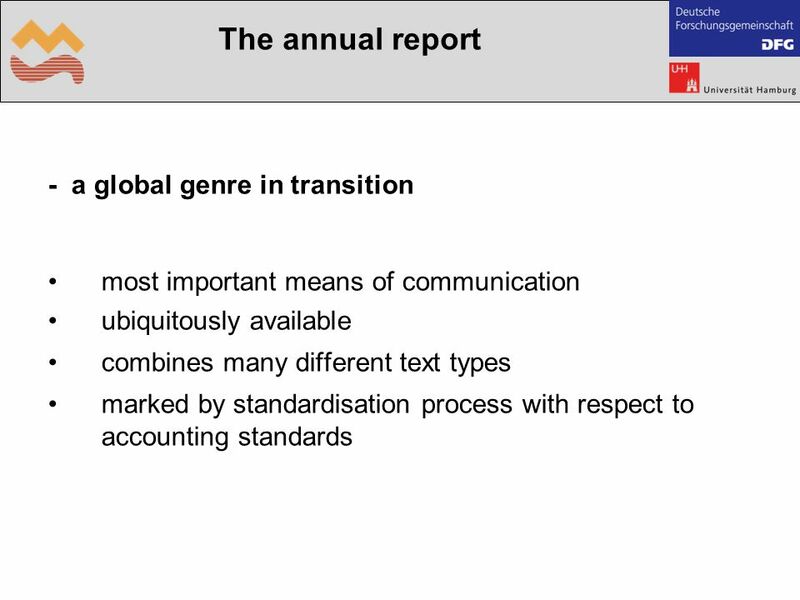 We laid the platform for growth and profitability and are now moving into the new year, visibly strengthened. 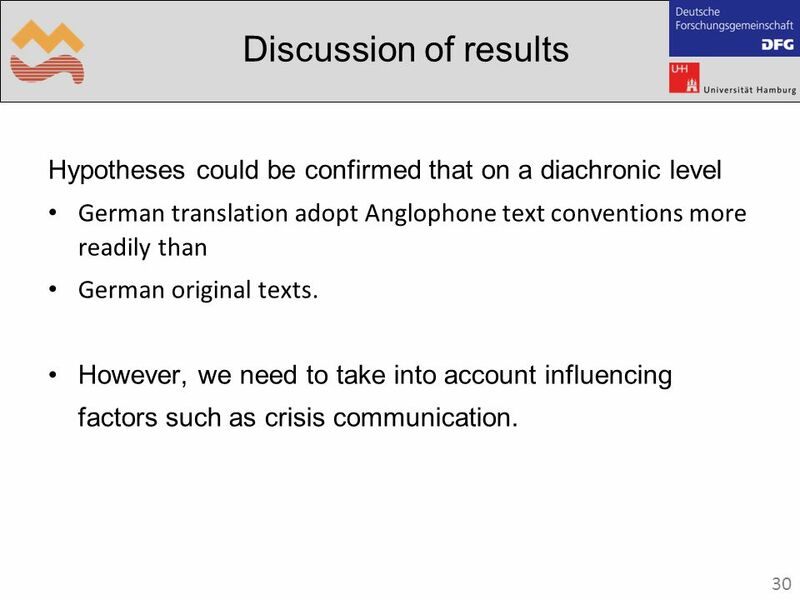 30 30 Discussion of results Hypotheses could be confirmed that on a diachronic level German translation adopt Anglophone text conventions more readily than German original texts. 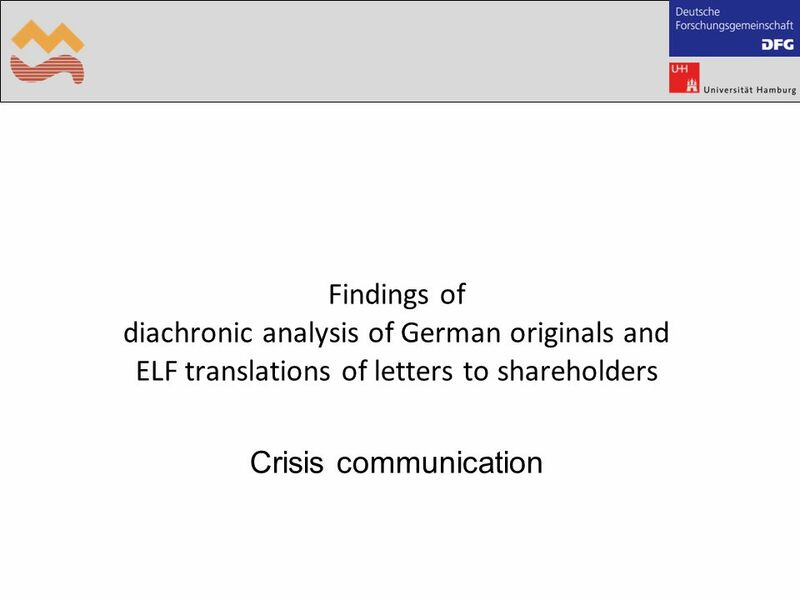 However, we need to take into account influencing factors such as crisis communication. 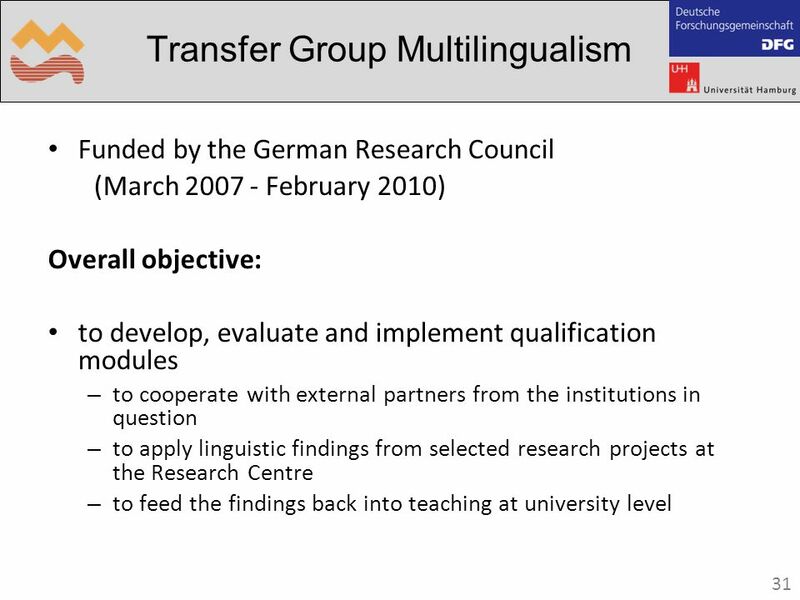 34 References Böttger, C. (2007): Lost in Translation? 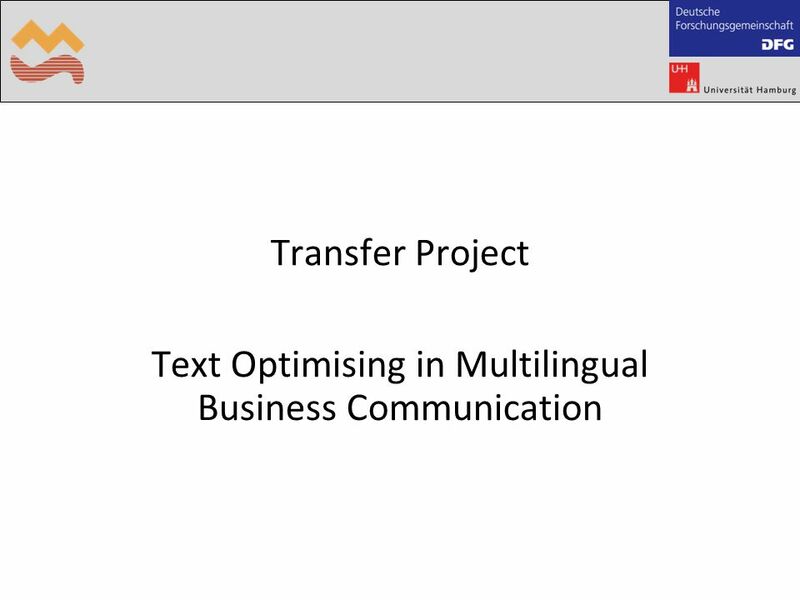 An analysis of the role of English as a lingua franca in multilingual business communication. 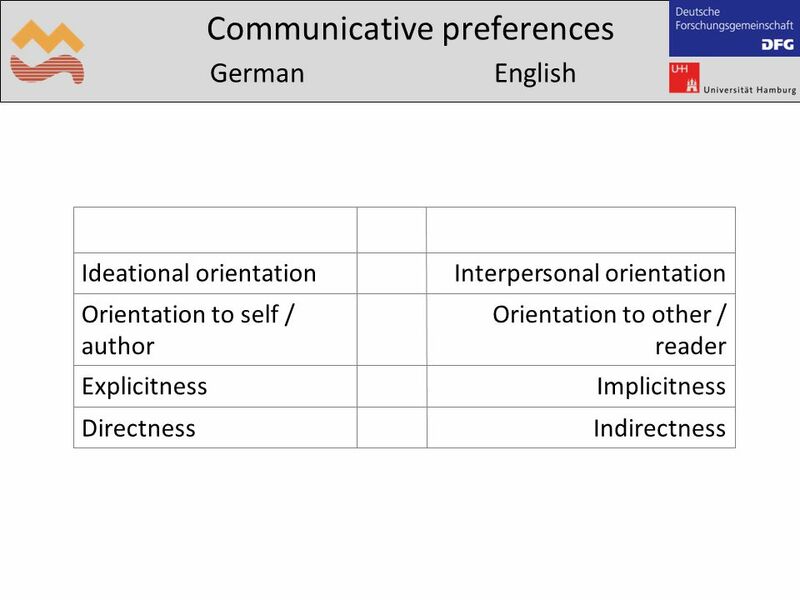 Hamburg: Kovac. 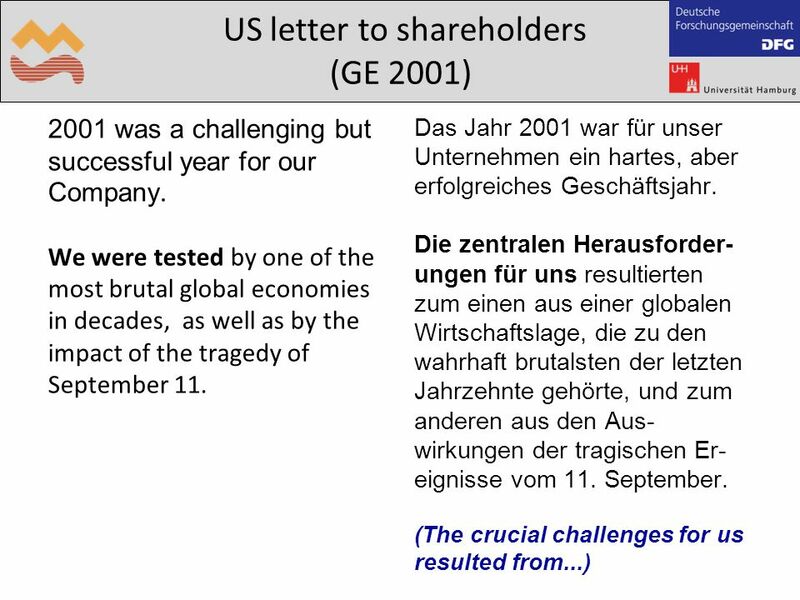 Bolten, J. 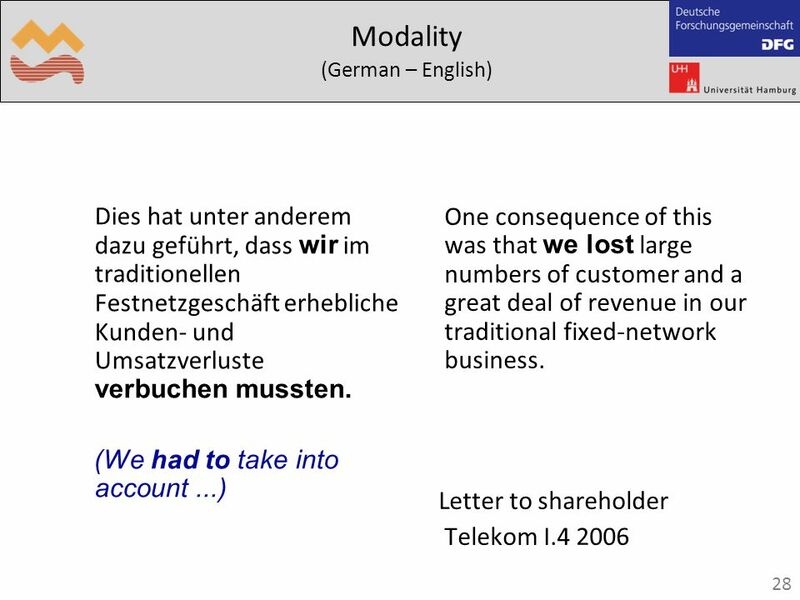 (1999): Kommunikativer Stil, kulturelles Gedächtnis und Kommunikationsmonopole. 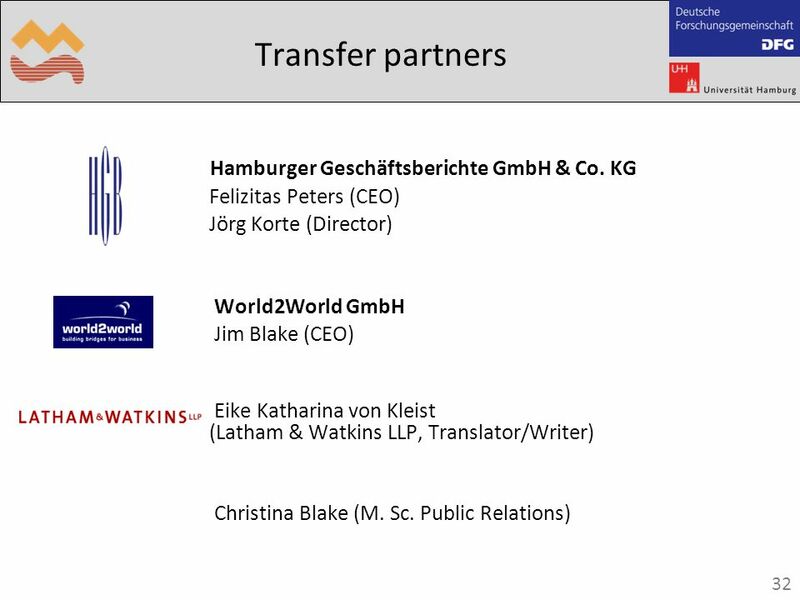 In: H.K. 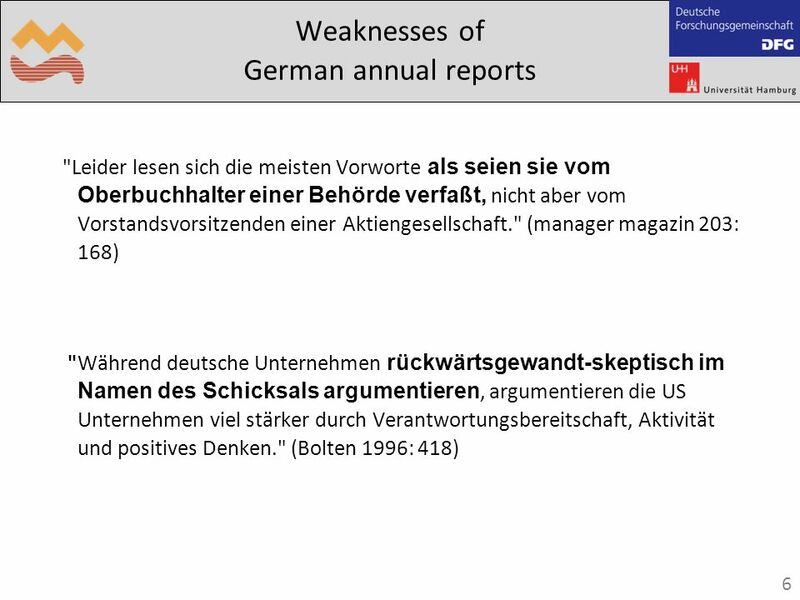 Geißner et al. 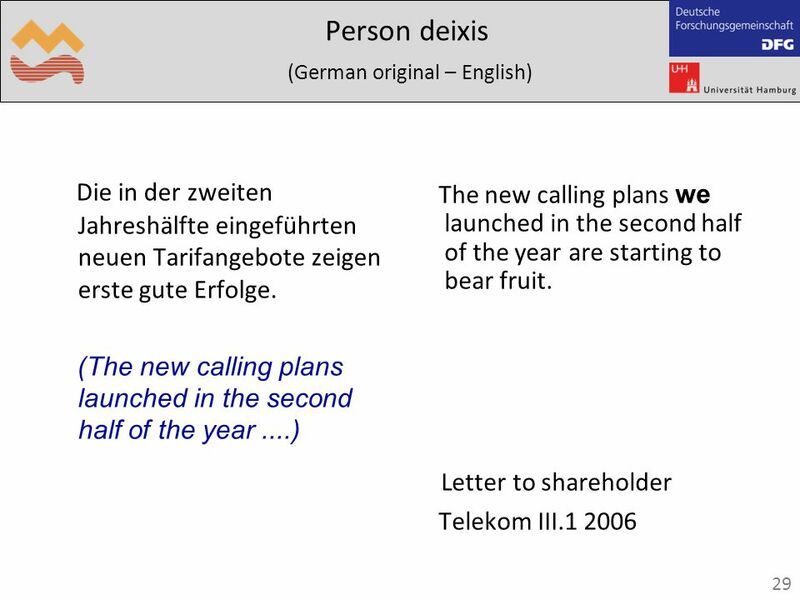 (ed.) 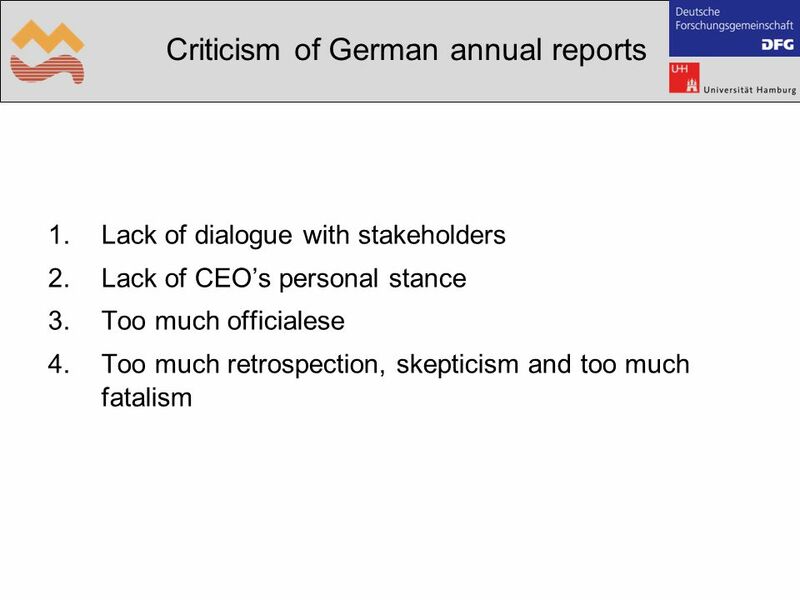 Wirtschaftskommunikation in Europa. Tostedt, 113-131. House, J. 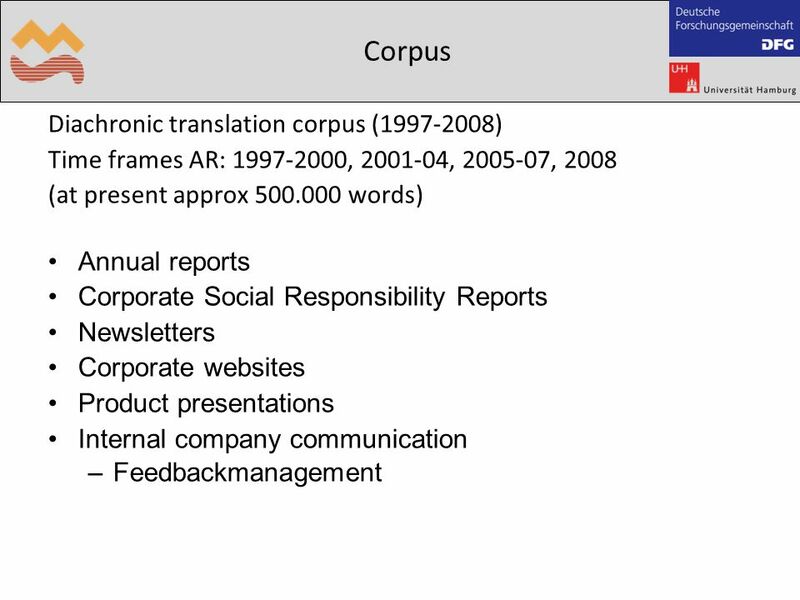 (1997): Translation Quality Assessment. 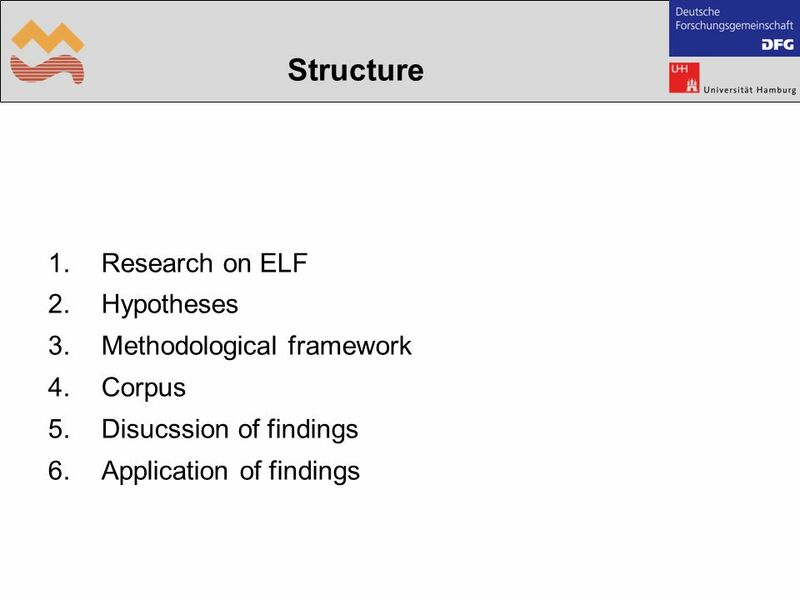 A Model Revisited. 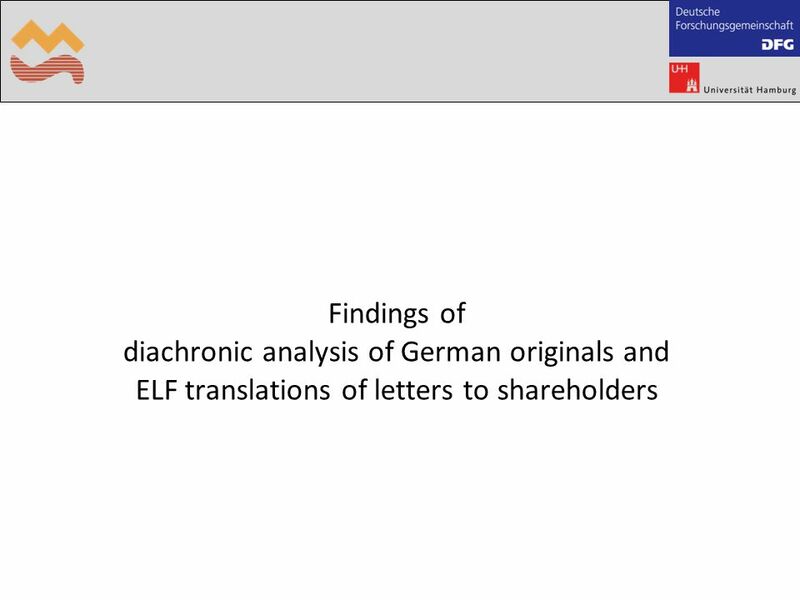 Tübingen: Narr. House, J. 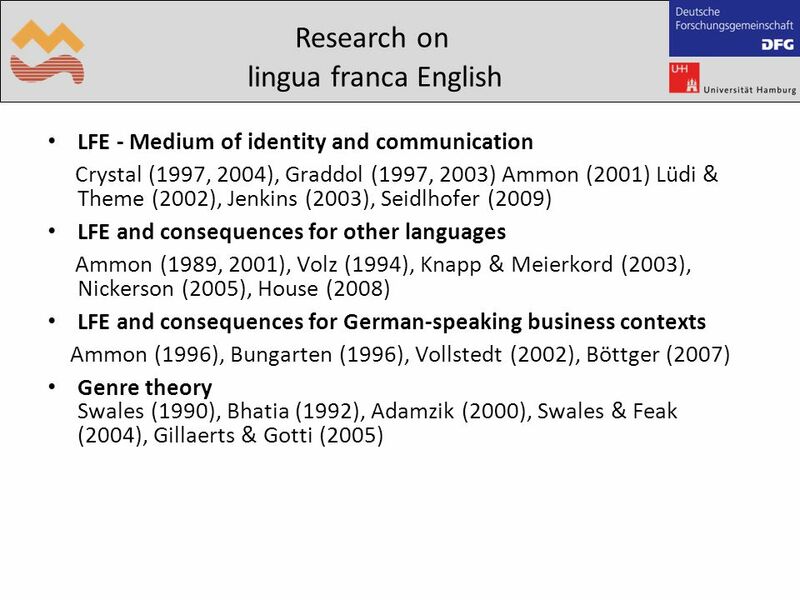 (2004): Explicitness in Discourse Across Languages. 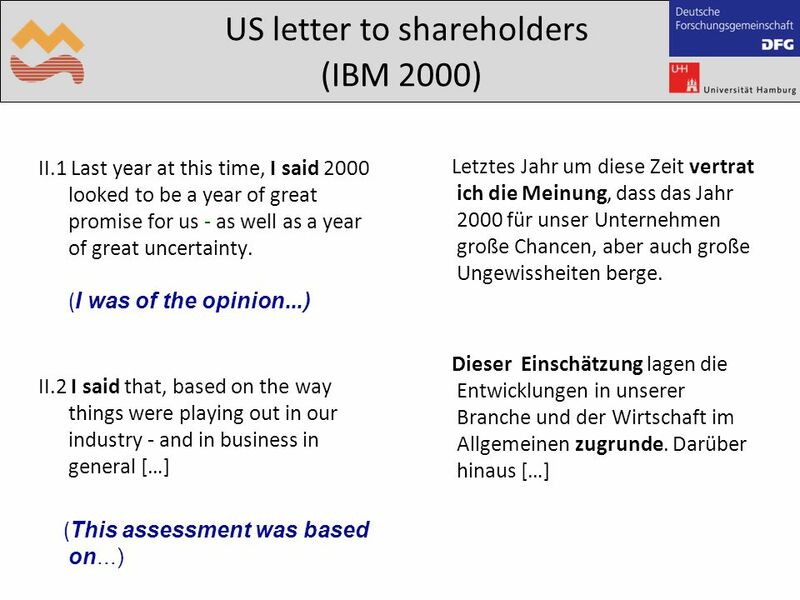 In: J. House, W. Koller and K. Schubert (eds. 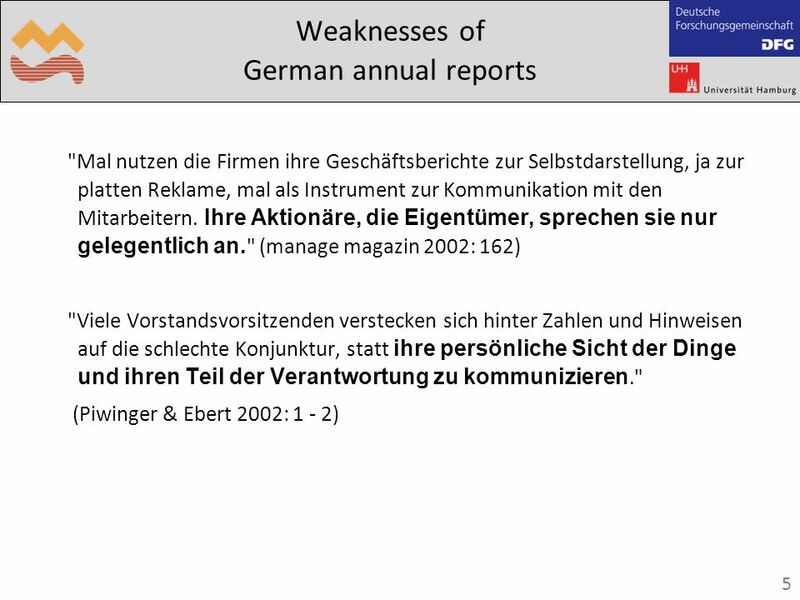 ): Neue Perspektiven in der Übersetzungs- und Dolmetschwissenschaft. 185-208. 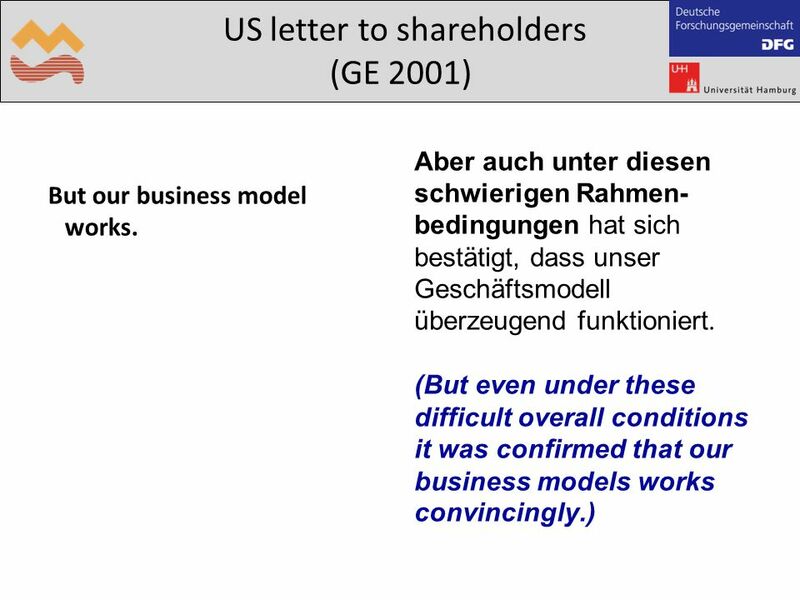 Hyland, Ken (1998): Exploring Corporate Rhetoric: Metadiscourse in the CEO’s Letter. In: Journal of Business Communication, 35 (2), 224-245. White, Peter R.R. 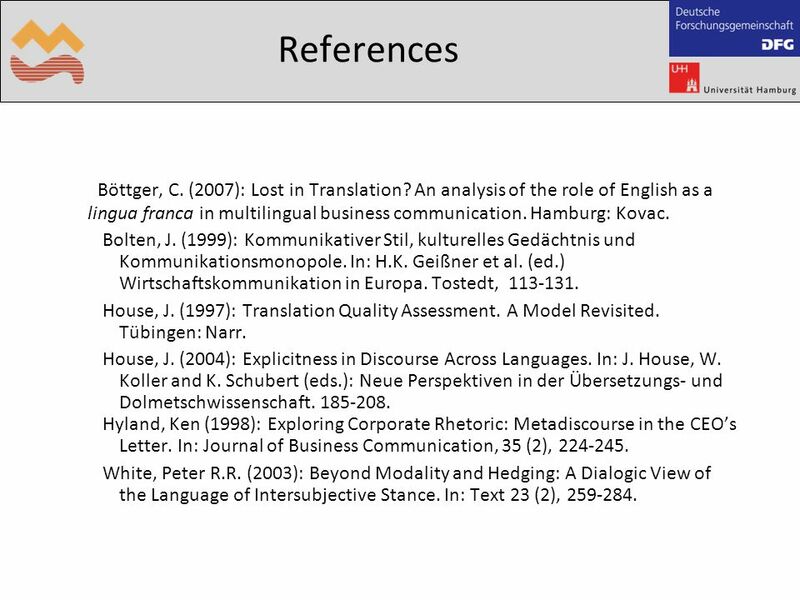 (2003): Beyond Modality and Hedging: A Dialogic View of the Language of Intersubjective Stance. 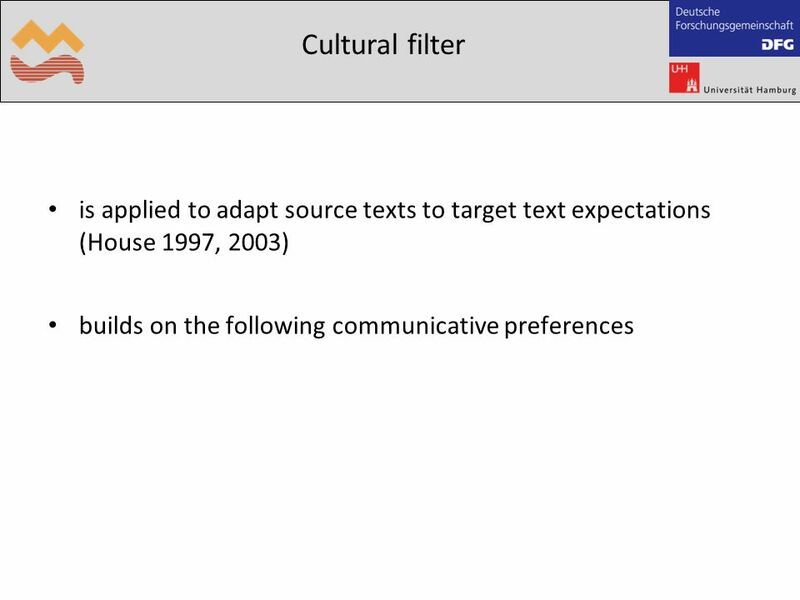 In: Text 23 (2), 259-284. 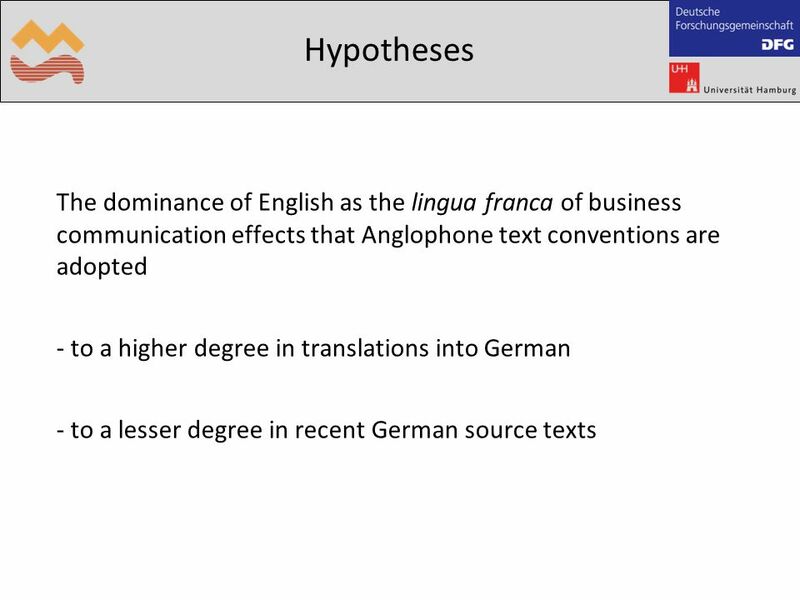 Herunterladen ppt "The Dynamics of Language Contact in Intercultural Business Communication: The Role of English as lingua franca in Translations of German Business Texts." How many past participles can you find in this elephant? List them! 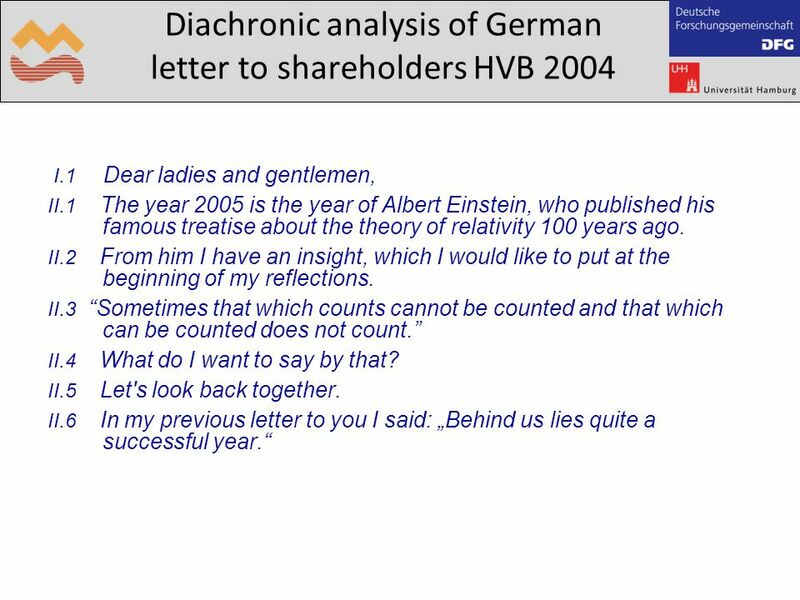 Relative clauses What is a relative clause?